Real Name: Al Simmons. 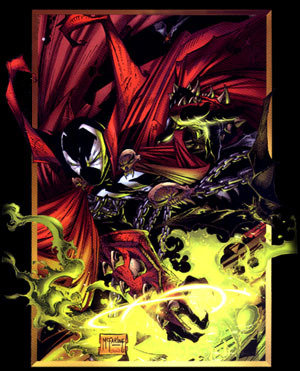 Powers and Abilities: Spawn's powers are limited by two things: his power level and his imagination. He has been shown to teleport, fly, fire blasts of energy, and bring the dead back to life. What's the Story? : Al was born to loving middle class parents who lived in a quiet neighborhood outside of Pittsburgh. he grew up like any other kid, going to school, and playing a few sports. However, his competitive nature set him apart. He was always driven to win and accepted no less than total victory in everything he did, whether it was on the ball field, or just having a conversation. He would never start a debate unless he could get his point across. To Al, there was no pint in starting anything if there was no way he could win. Al went from High School straight to College where he was first noticed and then recruited to the CIA. As part of his new job, he joined the military, rapidly going up through the ranks, and gaining a place on a special elite unit set to guard the president. While on duty with this unit, he saved the President from an assassin's bullet for which he was rewarded a huge promotion to Lieutenant Colonial. His combat skills and aptitude for quick learning brought him to the attention of Jason Wynn who became his personal mentor, drawing him publicly into the intelligence community. Jason Wynn was a master of manipulation, and led Al Simmons into believing, at least at first, that everything they did had a purpose and was for the good of American Security. The missions became more bloody with fewer rational explanations, some even causing civil wars. What was once a strong friendship, or so it appeared to naive Al, rapidly deteriorated as Simmons began to question his commander Wynn and his motives. This continuous butting of heads would not be tolerated by the likes of Jason Wynn, nor would it go unpunished. It was a mission just like the eight previous, where Al was going to kill in the name of his government when he was turned on by two of his fellow agents, Chapel and Priest, ironic names at best. The two agents opened fire on Al with laser weapons, burning him beyond recognition. Al had been set up by Jason Wynn because he'd become a thorn in the man's side. Al Simmons was buried with great media fanfare because he'd been their darling ever since his televised rescue of the president many months before. He was a hero, his coffin draped in an American flag which was given to his widow Wanda Blake while the country watched. Stories ran for days of the lad buried in Arlington National Cemetery who'd risked and lost his life, all in the name of his country. But existence didn't end for Al when he was burned by his treacherous comrades. At the moment of his death, he made a pact that he'd later barely recall. Al had always had an Achilles' heel, ill-afforded to a killer in his position. Al loved his wife beyond bearing and the deal hinged upon this. Though he was an atheist at the time of his death, Al would do anything to see his wife again and the Malebolgia took him at his word. In a split-second, or so it seemed, he was returned to earth. 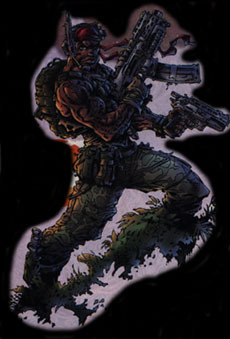 Al Simmons had now become an officer in training, one of Malebolgia's hand-picked Hellspawn for this century, bound to a symbiotic uniform and infused with hell-born energy. Al was able to follow orders, had killer instinct, and was willing to make the bargain; all of the Malebolgia's requirements. At first, Al was disoriented which was part of the Malebolgia's training plan. What had seemed only a second, was actually five years. Soon, was beginning to learn however, taught both by a demon chaperone, and with some knowledge from the Malebolgia himself. Al was faced with the choice of doing nothing with his new powers or using them, for good or for ill. If he did nothing, he would be allowing evil to continue and that would help serve hell. But he also know that if he became a force for good and killed those that were evil with his hell-born energy, as his instincts told him to, he would just increase the population on the armies in Hell readying for battle with Heaven. And even if he became evil, and used the power, accepting what he had become, he became that much more valuable to hell. Worst of all for Al, Hell is not content to wait for him to make his decision. His Guardian demon, the Clown, is there to dog his steps and push and prod him. This demon, who transforms into the hideously disfigured Violator, a creature born in the pits of hell, has chosen to target the loved ones from Al's life, and to put Al at odds with law enforcement and humanity in general. 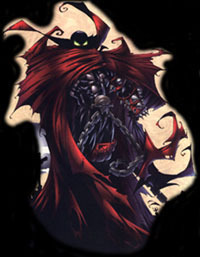 Spawn is hounded by them now, as the mob, the government and the cops all seek to stop this "cloaked enemy of society". It is this harassment that Hell hopes will drop the Hellspawn back to his instincts, those of a government-trained assassin, who would kill without questioning and act without thinking. But it turns out that Al's Achilles' heel is Hell's as well. he loved his wife and came back to see her. He has discovered that she is remarried, to his best friend, Terry Fitzgerald who was able to give her the child he never could. Although frustrated, he realizes that she is happy and so he's moved on to search for a new identity and a way to come to terms with his new condition. His love for her was so deep that it actually helped salve some of his wounds and he's begun to heal spiritually. He now has to find a way to go on, because this game too, must have a way to win. The easiest and most immediate purpose he sees is to exact revenge on Jason Wynn, whom he discovered, ordered his death. 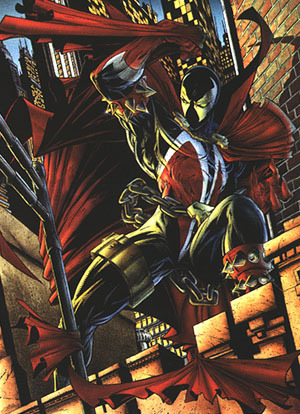 he's taken to living with the homeless people in the alley's Bowery, where he was first returned to earth, and has become their defender of sorts. He knows he should do something more for them and himself , but he now knows that the final curse laid upon him is that his power on Earth is finite. Once he is emptied of his Hell-born energy, he will be returned to the Malebolgia and become a favored slave leading an army of the damned with no hope of redemption. His task now is to use his powers wisely to figure out a way, if any, to break this contract, one that has never before been broken.